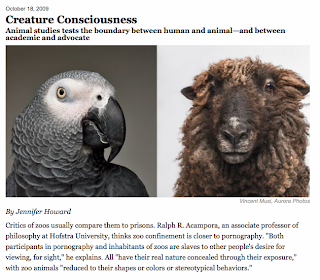 The Chronicle of Higher Ed has put together a piece on the emerging academic field of animal studies, which "has become a force to be reckoned with in philosophy, literary and cultural studies, history, and other fields with a traditionally humanistic bent." Humans are animals, too, and a lot of our existence is shaped by our evolutionary history, our biology, our circadian rhythms, the very narrow climate bandwidth in which we flourish ... What you have is a whole new set of theoretical paradigms that cut across what were previously separate and discrete ontological domains. The question is, how does the nature of thought itself have to change? How does the nature of reading have to change in the face of this new object of study? Cary Wolfe is editor of the University of Minnesota Press's Posthumanities Series. Wolfe and UMP director Douglas Armato provide more detail about the series and its beginnings here. Wolfe's new book, What is Posthumanism?, will be out in January 2010.